› What: Pizza Bros, 501 Cherokee Blvd. The Spicy Cowboy was highlighted by the calabrian chiles. It also includes salami, pepperoni, ricotta, buffalo swirl and oregano. It was not that long ago that a few of us here at the paper were lamenting the fact that the city didn't seem to have many choices when it came to pizza. You've got your national chains, of course, and Lupi's has been a staple for many years now. Then whammo! Pizza places have sprung up like coffee shops and craft beer joints, seemingly one in every neighborhood now. One of the latest is Pizza Bros, which is owned and operated by twin brothers Cal and Jackson Todd. I love pizza. Pretty much all manner of pizza, from the cheap frozen ones to some of the newer chain offerings. But when it comes to judging them, all are not created equally, and I have high expectations when paying premium prices. There are several things to like about Pizza Bros and several areas where it comes up as average. Pizza Bros offers cheese ($3.25) and pepperoni ($3.50), as well as a daily special ($3.75), by the slice or 16-inch pies. You can build your own or choose one of the 10 specialty pies, ranging in price from $17 to $23. The basic cheese pie will run you $14, and the Pesto Presto is $23. There is a Chicky Parm ($22) with tomato sauce, roasted tomatoes, chicken, roasted garlic, Parmesan and basil. You can also build your own, choosing from tomato, Alfredo, pesto, buffalo or barbecue sauces, seven cheeses, a variety of meats, including house Italian sausage, which is delicious, and a big selection of vegetables. Vegan cheese is an extra $3. The snack menu includes Doughboiz ($5), which are little puffy bread bites cooked in garlic oil and Parmesan served with two sauces, or Cheesy Garlic Bread ($6) made with roasted garlic spread and melty mozzarella. Snacks also include Nana's Sunday Meatballs ($7) and Jumbo Wings (six for $8 or 10 for $12). Pizza Bros also offers three sandwiches, including the Jack and Chicken ($8.50) with crusted chicken tenders, marinara, provolone and Parmesan; the Haulin' Balls ($9) with Nana's Sunday Meatballs, marinara, provolone and seasoned ricotta spread; and build-your-own hoagies ($9.50). 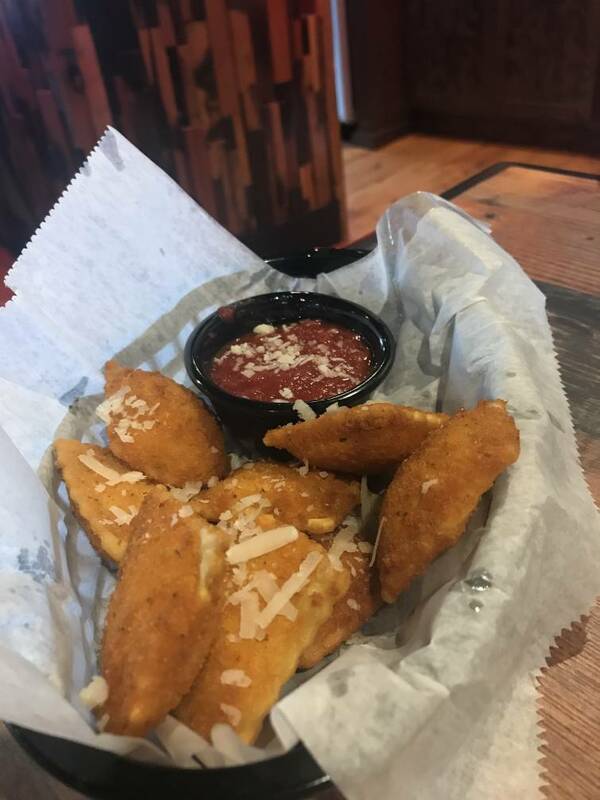 The Fried Ravioli are fried cheese squares served with a tomato sauce. Salads and desserts are also available, including New York Cheesecake ($6) and Cinaboiz ($5). On my first trip, we tried the Fried Ravioli (eight for $6 or 12 for $8), which was different than the frozen stick variety you get at a lot of places. These were little pillow squares, which I appreciated, but the flavors didn't jump out at you. We also ordered the Spicy Cowboy pie ($21) with tomato sauce, calabrian chilies, salami, pepperoni, ricotta, buffalo swirl and oregano. On a return trip, I got the New Yorker ($18) to go. It comes with tomato sauce, pepperoni, Italian sausage, Parmesan and oregano. As I said earlier, there is much to like about these pies. The crust at Pizza Bros is somewhere between the thick-and-chewy and thin-and-crust-like variety. It was perfectly cooked with crispy edges, and the 16-inch size is just right. All of the ingredients ring true, but the pies are lacking anything special. The dough creates a nice vehicle, but it has no flavor. 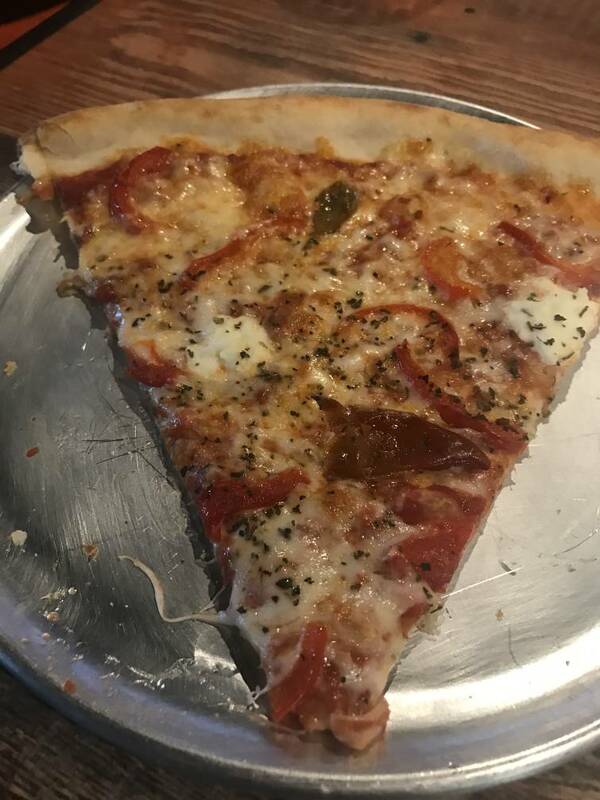 On the first pie, the calabrian peppers were indeed spicy, and good, as was the Italian sausage on the second; but otherwise, it was just OK, and you didn't get the flavors in every bite. The New Yorker features tomato sauce, pepperoni, Italian sausage, Parmesan and oregano. The tomato sauce is good, but not great, which, truthfully, is how the four of us who have tried the pies describe the overall flavor. But at $18, the expectation is higher than "Just OK." It's actually a criticism I have with several of the newer pizza places. It's like we've become afraid of big flavors. And garlic. There is no such thing as too much garlic. Pizza Bros is located in the space once occupied by Sluggos before it moved a few dozen feet up Frazier Avenue. The Todds did a nice job of redoing the place to give it a neighborhood pub-like feel with a large custom-built bar that covers a large portion of the front area. Three TVs are strategically placed around the room. On my recent visit, they had anime on one screen and the Outdoor channel on another. It's an open friendly space. Both times I entered the place, I was greeted by several staff members welcoming me and asking how my day was going. No doubt it is something they are urged to do, but it is still a nice touch, and frankly it goes a good ways with me. I'm going to choose the friendly place over the nonchalant, too busy or bored to care place every time. Again, there is much to like and I would go back. It's a nice place to meet friends, have a beer and eat a slice, but I would like to try building my own.